Technology. Just like in most aspects of modern life then technology is proving the biggest agent of change in the provision of the MBA. Yet the biggest change may be yet to come as shifts in how online content is created and shared continue to reach from their social and consumer base to grasp the education opportunity. The MBA has embraced blended learning for a while now, with most providers offering customers a far more flexible online/distance/attended approach. This of course matches patterns of consumption in all kinds of areas. It also begins to level out key factors such as location, work/life balance, cost and also diverse course requirement. It chimes with wider teaching practice, is undoubtedly more flexible and is arguably more efficient for all concerned. It’s more fluid; and it transcends miles yet it’s sometimes still expensive, wherever you are. The emergence of open source material is one of the most intriguing elements in the MBA landscape. In the last three years there has been an exponential increase in content made freely available to all of us – a lot of it of highly relevant and often of the highest quality. There are all kinds of providers now in the open source space. Most schools are offering ‘tasters’ (again very compelling and a very good way to attract fee paying students) but alongside that there are others intent on just sharing teaching. All kinds of channels – video, live/real-time streaming, apps, iPad based materials – are being used to greater or lesser effectiveness. The point here is that no one technology or channel is the answer. Whilst many praise the flexibility and ease of online content there is an equal case for the importance of real contact time, maximising the benefits of studying alongside and in close contact with a cohort of colleagues. Where will the University of the People, the Khan Academy and even iTunes take the next generation of potential MBA students? Surely the best way of using technology is to make it properly efficient, by the taking the time and resources it saves and re-applying them within the course framework. for a generation of people who have neither the time nor the money to invest in a more traditional MBA format. Putting the validity of this claim to one side there is a more basic but valuable lesson here. The modern world often deals in ever shortening timescales, the supply and demand of ll things increasingly packaged in ‘more in less time’ or ‘ just as good in less time’. Quicker, easier, cheaper. Available, flexible, cheaper. Modern, desirable, cheaper. Of course the Institutions have begun to respond. There is formalised content out there and some is now leading to accreditation, as we see from MIT Sloan. These ‘lite’ offerings are becoming increasingly popular but there are other leaps being made. We have the Facebook MBA (LSBF offers significant free taster content to its global 102,000 followers! ); and what happens when the Swedish University of Twitter offers an MBA course? 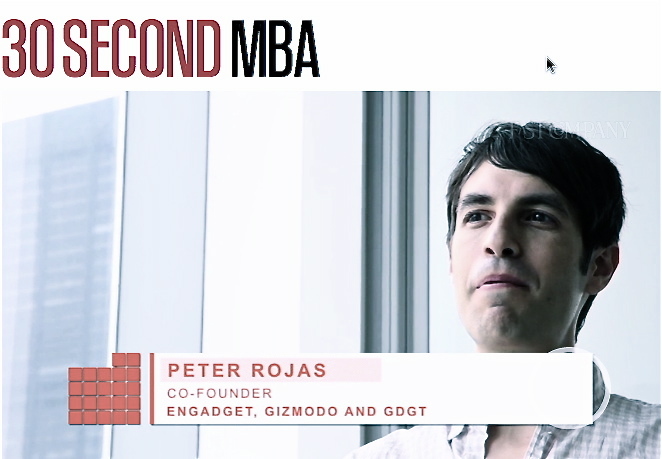 Thoughts on the 30 Second MBA? Again if we ignore the debate around its validity then the very existence of this format marks a clear trend in consumption. Going online to quickly find information, to watch a TED Talk, to network or tap into a forum – it’s become an essential part of an aspiring business leader’s life. There is a market for executive learning that fits with this. There is a desire on the part of the consumer for learning in quick, easily digestible chunks. How they use it is up to them. What it leads to is questionable. However, the very fact that significant contributors have entered this space make it of note. The world of open source content is one of the most fascinating and exciting challenges facing formal MBA providers. Whilst there is a definite sense of altruistic intent in this space– widening access, making content and premium education available to a far wider (and perhaps disadvantaged audience), there is also a long-term intent to claim significant ground in the market.